Traveling by RV with the family is the stuff dreams are made of. Sure, family adventures are not all toasted marshmallows and smiles. But, the memories of a good adventure will for sure last a lifetime. Of course, dads play a pivotal role in making sure everything goes smoothly on every trip. These things include everything from the actual driving and cooking, to the entertainment. 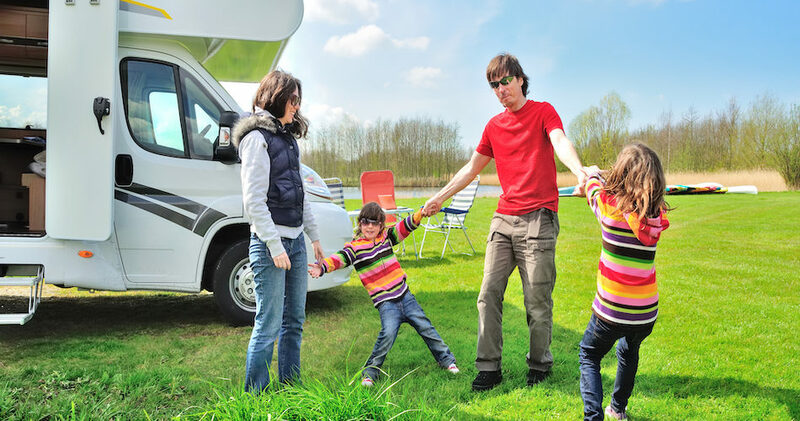 Here are 5 top RV travel hacks for dads that’ll make you feel like a pro. Do you use an outdoor propane fired grill for cooking? Does it use those bulky and expensive mini-propane bottles? Do you have to haul around a dedicated 20 lb. propane tank? You can cut out all that extra expense, transport and storage hassle by connecting your grill to your RV’s propane system. This is simple to do if your RV has a quick connect propane port. Most grill manufacturers sell a quick connect conversion line for their grills. If your’s does not you may still be in luck. Most propane connection hoses use standard fittings. Simply remove the old regulator/line combination and replace it with a new line that has the appropriate fittings. Once installed, you can connect your grill to your RV’s propane system just like connecting an air tool to an air compressor. If your RV does not have an external propane quick connect you can have one added pretty easily by a qualified RV tech. Nothing says camping like a camp fire. Getting a campfire going quickly can be a challenge. Unfortunately, you used the last real firestarter you had yesterday and that damp firewood the campground sold you just will not get going. Fear not! It turns out corn chips may be one of the coolest RV travel hacks out there. That’s right. Corn chips. They’re not only great at clogging arteries, they also make great firestarters. Toss a handful in the bottom of the fire pit and put some dry kindling over them. Light the chips on fire and soon you will be relaxing by a warm crackling fire. After a hard day of family fun, it can be nice to kick back by the campfire and enjoy a nice frosty beverage. As it turns out, your beverage of choice is in a capped bottle and you cannot find the bottle opener. That cap is no match for a little dad ingenuity. Bottle caps can be removed with many common household items including countertop edges, rings, belt buckles, keys and even a properly folded dollar bill. The key is to be able to hook the cap lip on a hard object and then either use the object to pry, pop or work the cap off. With a little practice you will never need a bottle opener again. The last of the RV travel hacks can be a lifesaver. If your travel trailer or fifth wheel is a dual or triple axle set-up you can safely change a flat tire without the use of a jack. Tow your trailer to an area where it is safe to work. Stack up leveling blocks several blocks high (about 5 blocks should do it). Then pull or push the trailer so the good tire next to the flat tire rolls up on the blocks. This will get the bad wheel high enough to remove it and replace it with a spare. With the new tire on, lower the trailer back off the blocks and you are ready to continue on your journey. This Wilderdad story was supplied by a special guest. We hope you love it and find the information helpful. If you have any questions or comments about this content, we want to hear from you! Email thewilderdad@gmail.com and we'll get right back to you. Happy adventuring!